What’s So Hard(ened) About Vents? The idea of “containment venting” has been front and center in discussions about the Fukushima Dai-ichi nuclear accident and what the NRC wants plants to do to improve their vents. But to most people outside the nuclear industry vents are the things in our houses that hot or cold air flows through. So here’s a little background. The accident in Japan involved what’s called a Mark I boiling-water reactor. Mark I designs have a relatively small structure, or “containment,” to hold in steam and radioactive material if an accident occurs. 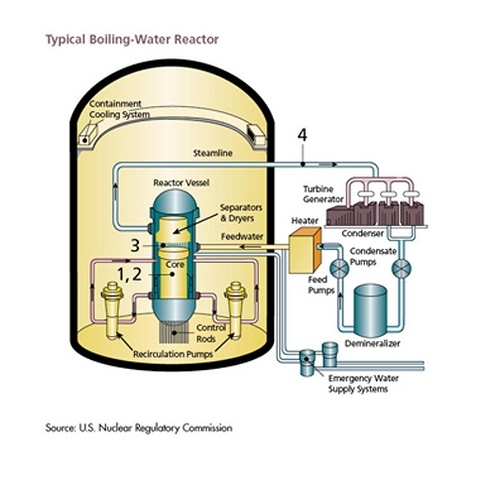 If pressure inside the containment gets too high during an accident, the reactor’s safety systems will have trouble pumping water into the core to keep it cool – which will make the accident much worse and possibly lead to high levels of radiation escaping into the environment. Part of this accident scenario also involves hydrogen gas building up inside containment. As we saw at Fukushima, if hydrogen is not allowed to escape, it can explode and damage the reactor building, which also could lead to radiation leaking into the environment. This is where vents come in. They can be used to reduce pressure in containment so that water can still be pumped through to cool the fuel rods. The vents can also safely release built-up hydrogen to prevent explosions. On March 12, the NRC issued an Order to all U.S. Mark I plants, as well as similar Mark II reactors. The Order requires Mark I plants to ensure their vents are hardened and reliable, and it requires Mark II plants to install hardened, reliable vents. “Hardened” means these vents must withstand the pressure and temperature of the steam generated early in an accident. The vents must also withstand possible fires and small explosions if they are used to release hydrogen later in an accident. The vents must be reliable enough to be operated even if the reactor loses all electrical power or if other hazardous conditions exist. The NRC staff will issue, later this summer, specific guidance on the requirements for containment vents. In order to ensure these vent improvements are properly designed and installed, the NRC has set a deadline of Dec. 31, 2016, for the Mark I and II plants to comply with the Order. Phase 1 (severe accident capable wetwell venting system): no later than startup from the second refueling outage that begins after June 30, 2014, or June 30, 2018, whichever comes first. Phase 2 (severe accident capable drywell venting system): no later than startup from the first refueling outage that begins after June 30,2017, or June 30,2019, whichever comes first. Where are we regarding the compliance date in December, 2016? Also, is this date for modifications to be fully completed or is this some “nebulous” standard of compliance in which if a complete power loss occurred two days after that date we’re still no safer than the day before? I feel as though these precautions should have taken place before disasters such as the Fukushima Dai-ichi nuclear accident happen. Where were the environmental risk management programs? Glad to see some effort is being made, but we could have and should have done better. Sir, i have a doubt . If the fuel is reused for the second time, its efficiency is reduced and the amount of sludges and vent dusts may increase. At that time if the same ventilation mechanism is used, can those ventilations survive otherwise what is the solution? Managing the proper pressure levels in our own water,gas,oil systems is already challenging enough, with the use of various valves, gates, stainless steel and what not. Imagining containment of such a tragedy is difficult. I am familiar with industrial supplies for pressure management, ball valves and such, but would they have much play or usage in this type of situation. The comment about CANDU safety is misguided. The end-point (reactor meltdown) for any Generation II plants would be similar under station blackout and lack of ultimate heat sink situation, with varying degree of release due to containment designs. The slight negative containment pressure during normal operation neither can be sustained nor would be a match to the energy release during extended station blackout, therefore is irrelevant in this case. No reactor is designed perfect. Nothing in engineering is made to perfection. All reactors HWR or LWR reactors can suffer a LOCA event. The advantage of small modular reactors SMR’s is they’re gravity passive fuel dump safety features plus the nucleotide dynamics are an added layer of safety. Besides the aggregate event fail is smaller than multi-gigantic light water NPPs. The boiling-water reactors used at Fukushima are of an inferior US design. Had the reactors been of superior Canadian CANDU design, the Fukushima incident would have been a non-event. Canadian CANDU designed reactors have multiple safety systems including a Negative Pressure Containment Vacuum Building which prevents the escape of radioactive materials in the event of a Loss of Coolant Accident. Canadian designed CANDU reactors are the safest most reliable reactors in the world!